Check out our list of the best Joomla Black Friday deals in 2018. This year the holiday season openings, Black Friday and Cyber Monday fall on November 24th and 27th respectively. Check out the most complete list of the best Joomla Black Friday deals in 2017. These two days are the best days of the year to purchase a new extension or template for your Joomla site. Many companies use these special days to give out limited time offers and increase their customer base. In this article we collected the best Black Friday deals for Joomla in 2017. You can find various great extensions, templates and services here so you can easily keep track on the offers. Be sure to check out the article every day as new offers are added constantly. If you like the offers, don’t forget to bookmark the page! Description: 70% template club, 50% multi-site extension, 35% single site extension & templates. Take advantage of the biggest discount promotion we are holding this year, the RSJoomla! Black Friday Sale. Date: November 24th 10:00 UTC+2 – 26th 16:00 UTC+2. Coupon: Coupon is not required to purchase any Joomla Extension or Joomla template. Description: Get all JoomlaShine products and 12 months subscription with only $199. It is once-in-a-lifetime chance to get the best deal ever! Description: Techjoomla is one of the leading extension developers in the Joomla Sphere today. Both community supported as well as commercially supported extensions serving a variety of uses are provided by us. Some of our popular extensions are: Give, JTicketing, Quick2Cart, Shika. Description: JoomDev is a Joomla Template Development company, offering Flat 45% discount on all Joomla Template. 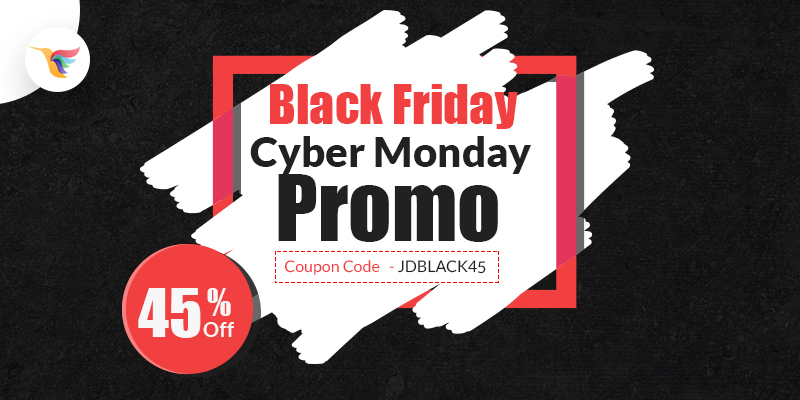 Use coupon code JDBLACK45 at the time of checkout. Coupon: Grab the deal! No coupon code needed. Description: We provide great commercial templates for Joomla. We offer 35% discount on all Joomla templates during this limited time period. Description: One of the biggest theme shops in the business, Elegant Joomla templates are offering 35-50% off all purchases, which is the largest discount they’ve ever offered! Description:JoomShaper is known for amazing and modern Joomla templates with a very clean code and powerful design. You can choose from 100+ Joomla templates in their store.